When working on devices with touchscreens, or if you have to zoom way out for particularly large schedules, using your fingers or the mouse to change dates or durations can be difficult or imprecise. 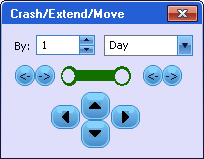 To make fine-tuning easier in these cases, NetPoint provides on-screen gestural controls for decreasing and increasing the duration of an activity (known as crashing and extending, respectively), and for moving one or more objects horizontally (known as pushing and pulling) and vertically (known as shifting). Keep in mind that when you use the gestural controls (or arrow keys on the keyboard) to push or pull multiple objects, each object will move according to the working days (or time units) defined in its own calendar. If all objects have the same calendar, then using the gestural controls or keyboard arrow keys to move multiple objects can achieve expected results. However, if some objects have different calendars, those based on calendars with more working days will appear to move ‘faster’ on the canvas. In this case, using the mouse may yield results closer to your expectations. For more info, see the Notes section below. NOTE: If a milestone is assigned a calendar that’s different from that of its predecessors or successors, and the network is pulled backwards, gaps may open up as the chain crosses a weekend or non-working days. As such, it is recommended to always keep milestones on the same calendar as their predecessors/successors. Click the Gestural icon in the toolbar. Select the desired activity on the canvas. To select multiple activities, select the desired activities one-by-one on the canvas using the Multi-Select Tool, or click on a blank portion of the canvas and drag a rectangular marquee box around all of the desired activities. Enter a number next to By or click the up and down arrows to modify the magnitude of the change. To crash or extend by percent duration (as opposed to by time), click the dropdown arrow and choose Percent. To reduce the duration (crash) of the selected activities from the start, click the innermost arrow at the start (or press Lon the keyboard + the RIGHT arrow key). To reduce the duration from the finish, click the innermost arrow at the finish(or press R on the keyboard + the LEFT arrow key). When finished, click the red Exit icon. Select the desired object on the canvas. To select multiple objects, select the desired objects one-by-one on the canvas using the Multi-Select Tool, or click on a blank portion of the canvas and drag a rectangular marquee box around all of the desired objects. Enter a number next to By or click the up and down arrows to modify the magnitude of the change. Positions may only be moved in increments of time. If percent is chosen, click the dropdown arrow and choose Day (or, if PolyTime is enabled, the corresponding time unit). Otherwise, pushing/pulling will be disabled. To move the selected objects later in time, click the RIGHT arrow button below the activity (or press the RIGHT arrow key on the keyboard). To move the selected objects earlier in time, click the LEFT arrow button below the activity (or press the LEFT arrow key on the keyboard). NOTE: If optimizing or performing what-if scenarios, it is recommended to use an increment of no greater than 10. Large increments should only be used in specific situations (e.g. if a window is missed and the network must be delayed a year). To move the selected objects up a grid, click the UP arrow button below the activity (or press the UP arrow key on the keyboard). To move the selected objects down a grid, click the DOWN arrow button below the activity (or press the DOWN arrow key on the keyboard). 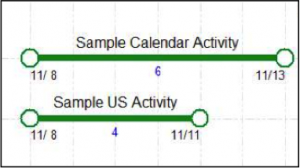 If both “Sample Calendar Activity” and “Sample US Activity” are selected and dragged with the mouse until the starting date of the first activity is 11/8 the following is the result:. 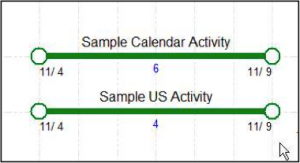 The difference occurs because the “Sample Calendar Activity” is moved by 4 calendar days, while “Sample US Activity” is moved by 4 working days (equivalent to 6 calendar days because the starting point of each activity moves past a weekend).